The 2015 Hyundai Santa Fe is the perfect option for Texas families, who are looking for comfort, utility and style out of their SUV. Keep reading our 2015 Hyundai Santa Fe review, as we walk you through all of the exciting features and amenities this excellent SUV offers. 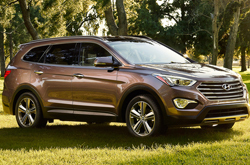 SUV shoppers looking for the 2015 Hyundai Santa Fe in Carrollton will find a host of fantastic features on the compact sport utility, including an impressive 71.5 cubic feet of available cargo space, room for up to seven passengers, a powerful engine and a 5,000-pound towing capacity. The 2015 Santa Fe comes in two models: regular edition and Sport edition. To get the most out of the 2015 Hyundai Santa Fe, our review suggests going with the Santa Fe Sport 2.0T model, as it provides the most power (264 horsepower and 269 lb.-ft. of torque), as well as the best sport features that most Santa Fe drivers will be after. Features on the 2015 Santa Fe Sport 2.0T include 18-inch alloy wheels, a Proximity Key entry with push button start, hands-free liftgate, twin-tip chrome exhaust, foglights, automatic headlights, roof rack side rails, power heated driver and front passenger seats, a 4.3-inch color touchscreen, a leather-wrapped steering wheel and leather interior. Safety features on the Sport 2.0T are also robust, with the SUV offering a rearview camera, blind-spot monitoring, rear cross-traffic alert, lane change assist, electronic stability control and antilock brakes. Our 2015 Hyundai Santa Fe review highly recommends this gorgeous SUV. Texas families will find the Santa Fe feels like both a luxury SUV and a fun off-roader, which means that this SUV has something for everyone in the family. 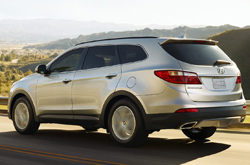 The 2015 Hyundai Santa Fe is now in Carrollton, so stop by our showroom and test drive the Santa Fe today! Look for even more details about the 2015 Santa Fe below, as well as a video review and exclusive pics. What are you waiting for? Find your Santa Fe now! Compare Hyundai's latest model of the Santa Fe to its rivals and we're certain that you'll choose it over vehicles like the 2015 Kia Sorento, Toyota RAV4, Chevy Equinox, Honda CR-V and the Ford Explorer. If the Santa Fe's passenger-oriented cabin features and eye-catching exterior styling don't prove to you that it's the right vehicle for you, we're sure its cut-rate pricing will. For Dallas Hyundai customers who want a truly amazing value, just compare this vehicle's price to the aforestated list of vehicles and you'll see that it's a worthwhile investment. Glance over our facts list to learn more about the Santa Fe - bullets underneath this text. To make your car search easier, Van Hyundai is happy to offer research tools like the 2015 Santa Fe review above, as well as reviews of previous year models. 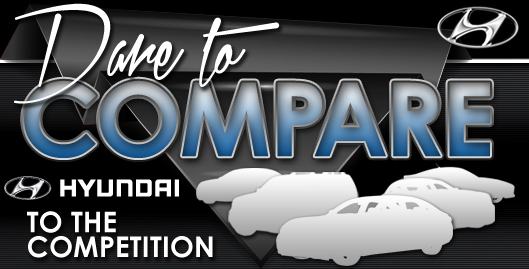 We take our duty to provide the best reviews composed by automotive experts - it's just one more thing that makes us a leading Hyundai dealership in Dallas. To make intelligent decisions when it comes to your next Hyundai purchase, don't guess! Each overview is bundled with information, including info about vehicle features, in an easy-to-understand format. 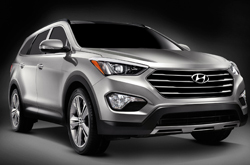 Now that you've read Van Hyundai's Santa Fe review, please fill out the form on the right to message us to setup a test drive or learn about current financing offers and deals from the OEM.